Katharine is a member of the keyboard faculty at Royal Birmingham Conservatoire, teaching students on undergraduate and postgraduate programmes and she also delivers a series of classes to all undergraduate pianists on piano pedagogy. Katharine runs a small, selective, private teaching practice that caters for talented young pianists, music professionals and adult amateurs. Katharine’s students have gone on to achieve great success at numerous competitions both at local and national level. A number have achieved top grades in exams and performance diplomas at exceptionally young ages. 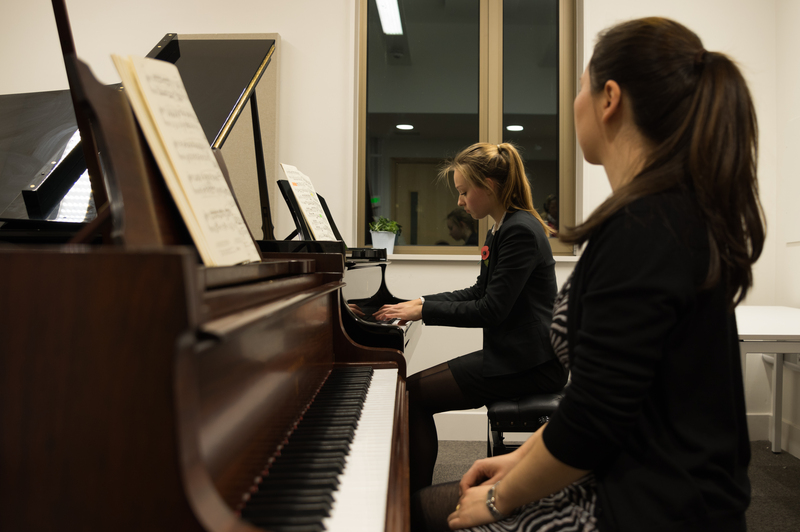 After graduation, many of Katharine’s Conservatoire students are making significant contribution to the music profession, performing and teaching both in the UK and internationally. Some have gone on to further study abroad at notable institutions such as the Liszt Academy, Budapest; Ithaca School of Music, New York; and the University of Auckland, New Zealand. Katharine teaches a small number of music professionals who have sought extra support and added inspiration and guidance for particular projects and goals. “Teaching students who are dedicated to the piano and to developing their piano playing, is a most rewarding and serious passion of mine. I am always interested and motivated to discover how different each of my students are; how they each bring individual strengths and fresh perspectives not only to the music they are studying but to the way they approach the piano; aspects of tone and sound production and technique in general. It is in finding ways to help and inspire each individual person; to play a part in exploring music together through introducing some of the endless wealth of our piano repertoire and in seeing students become much more robust and independent musicians, that makes my work so fulfilling and worth-while. My lessons with Katharine are transforming my playing and giving me a confidence I’ve never had. She somehow combines a rigorous attention to textual detail and technique with a natural, instinctive musical flair. The fact that this wisdom is delivered with such unfailing kindness and empathy makes every lesson a real pleasure. Katharine Lam brings to her piano teaching a rare combination of the technique and musicianship of a practising professional pianist coupled with equally professional communication and teaching skills. Her approach is founded on analytical listening and observation which enables her to give focused guidance on technical matters and the methods of practising for any particular piece. However, technique is always treated as a means to a musical end and she has an unerring ability to explain – and demonstrate – what is required to communicate the musical meaning of a piece to an audience. Katharine’s personal style does not lack rigour, but she is always calm, supportive and encouraging. I studied with Katharine for 3 years during my undergraduate degree, and in my opinion she is one of the finest piano tutors Royal Birmingham Conservatoire can boast. Katharine is always very patient and has a very personal approach, every individual need is met. I would strongly recommend Katharine as a teacher, as such a fine solo performer she really knows how to get the best possible sound out of a student regardless of their technical ability, but at the same time can encourage the best potential technical ability to emerge from any student. 10/10 best piano teacher I’ve had. I have taken lessons from Katharine for six years and never once have I felt the need to switch teachers. Her unique teaching style has allowed me to significantly improve my technique and understand the deeper meaning behind music. She always ensures that I am the most prepared I can possibly be for competitions, exams and other musical events. Katharine is always patient in my lessons and works on improving my playing with gentleness and great insight. She is always watchful of every aspect of my playing and points out my needs with great clarity. She gives me a library of ways to practise certain passages and a wide range of exercises to improve my playing – my particular needs being evenness of playing, finger strength and left hand work. I leave every lesson always feeling inspired and ready to work on my next goals. As a teacher Katharine has a unique ability to spot any technique problems and devise an immediate solution. My lessons are always informative, instructive and inspirational; she gives 100% and I appreciate her candour. I like the way Katharine does the best for me personally. She always gives constructive feedback and gives me exercises which will improve my performance. She is really understanding, supportive, encouraging and positive. Time flies so quickly because I am enjoying the lesson so much. Before a concert Katharine gives you a pep talk and because of the many experiences she has had she knows what is best and how best to prepare. Katharine’s own playing is very inspiring. Katharine taught me for 5 years when I was at the stage of trying to figure out what to do after passing my ABRSM grade 8. She took me on to a musical journey where I achieved my Diploma ABRSM, BMus(Hon) and several memorable piano performances. She teaches in particular, important musical aspects and deeper understanding of the pieces. She is very good at explaining sections in a metaphorical way and introduced me to fingerings that not only make sense musically but to suit my smaller hands. Katharine is a great teacher, if you are serious about developing your piano skills and would like to experience the joy of music I can highly recommend! I love hearing you play and wish we could hear more! I am so grateful to you for taking the girls on in our hour of greatest need and for being such an incredibly strong, supportive, musically A*** trustworthy and reliable, as well as being such a positive, constructive and melody-loving teacher. The girls have developed so much in their short time with you and we look forward to having more time now to learn from you and enjoy further musical enlightenment. I’m a student from China. I studied with Katharine for six years in the U.K. In the past six years, I have learned a lot of knowledge about music and piano playing skills. She is passionate about teaching and she has a patient and interesting approach. She is a teacher who is good at identifying problems and has a great capacity for solving them. I think that she showed me all the good qualities of an excellent teacher. I studied with Katharine Lam for the second year of my Masters Degree at Royal Birmingham Conservatoire. My dear tutor Katharine is a responsible teacher in many aspects of her teaching. In her lessons she was always at my side to give me proper solutions for each problem I encountered with my playing. I studied a variety of musical styles with her. Furthermore she attended all my recitals to support me and to offer constructive criticism and suggestions about my performance. She set a good example for me, being that the best teachers always teach students not only what the goal is but also how you can reach the goal. This influences me now in my own professional teaching work. Katharine has been a passionate and patient teacher who helped me a lot to improve my piano playing skills, as well as being a mentor for piano pedagogy. Having now graduated from the Conservatoire, I always remember the advice she gave me, which is very helpful. I always looked forward to piano lessons with Katharine as I knew in every lesson there would be a new skill I’d learn or inspiration I’d get from her. Although my time studying under Katharine was short (about 8 months), I learnt a lot of skills with her and I completed Master of Music with distinction. The main skill that I learnt is ‘How to play with relaxed hands and produce a round sound’. She is also a caring teacher who encourages, enquires and helps with progress. I recommend Prof. Katharine to students at all levels.